I have been inspired by Mr. Ward. Here is the letter (with many factual modifications to protect the young person in question) that I wrote on the occasion of that young person’s High School graduation. Word cannot express how proud I was as I watched you walk on the stage and receive your graduation diploma. Tears came to my eyes then and tears come to my eyes now as I write you this letter. Seems like just yesterday, that I walked with you to your first day of school. I know you were frightened that day. But, I will now confess you to you, that I was even more frightened. I knew that you were at the beginning of a long journey to prepare yourself for a life. These years have been a great adventure for you and for me. We have had our ups. We have had our downs. But, today, your graduation, commemorates part of your success (your dad wants to think that part of it is “our” success). Today marks the end of one chapter of your life and the beginning of a new chapter. It will be your family, friends, and other personal relationships that will be most important to you. And yes, your career will contribute to those things. But, you are more than your career. Never confuse having a career with having a life! On that note, I would like you to consider two things that could have a profound impact on your future. These are: (1) “good citizenship” and (2) “your citizenship”. You have been given much (and earned much). People like you, have the obligation to contribute to the “well being” of our society. This can be done in many ways. But, remember not everybody has had the opportunities that you have had, and will have. There are many who have not had the benefits of your good fortune. Many of those who have had your good fortune, have not taken advantage of that good fortune. Through a combination of “nature” and “nurture” you find yourself in a strong position. That is your reality. Some are in a very weak position. “A country that cannot care for it’s weakest citizens, cannot protect its most powerful citizens”. You have a moral obligation to bring your intellect, vision, enthusiasm, effectiveness and generosity to your career, your family (present and future) and your community. You have an obligation to be help our “weakest citizens”. Helping others can be one of the greatest values of your education. “Good citizenship” includes a consideration of how your behavior impacts your community. 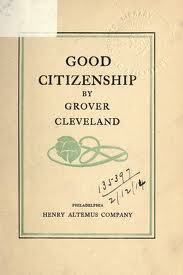 “Good citizenship” also includes a consideration of how your behavior impacts on you present and future family. Now, I would like to reflect with you on “Your Citizenship”. Yes, you are a Canadian. Yes you have lived almost your whole life in Canada. You can and should take pride in being a citizen in one of the greatest countries in the world. But, you may recall that you were born in the U.S. This great event happened when I was doing my MBA at Stanford. (Actually, you probably don’t recall being born, but it did happen in Palo Alto, California.) What does being born in the U.S. mean? It means that the U.S. considers you to be a U.S. citizen. You lived in the U.S. until you were 4. My career brought our family back to Canada where we have lived ever since. In fact, I suspect that you have no memory of those early years of your life. Therefore, it is possible that you don’t think of yourself as being a U.S. citizen at all. You are legally a “dual citizen” of Canada and the U.S.
Is your dual citizenship a good thing or a bad thing? Given that you have lived your whole life in Canada, is your U.S. citizenship a “benefit” or is it a “burden”? The time has come to consider whether you want to go forth in life as only a Canadian citizen or as a dual Canada/U.S. citizen. This is a decision that you will want to consider carefully, and when you are ready, you must make that decision. You do NOT need to make this decision today or next week. But, I urge you to make this decision before finishing your degree at Queen’s. I will explain why in this letter. U.S. citizenship is the source of opportunity, liability and disability. You have the right to live in and work in the the U.S. This may be a benefit to you. This is something that most of your classmates at Queen’s will not have. You may want to retain U.S. citizenship, in order to keep that option open. But, as you will learn in your commerce program, options are never free. They come with associated costs. In the case of U.S. citizenship it comes with certain liabilities and certain disabilities. It is important that you understand the liabilities and disabilities of U.S. citizenship. You may or may not, see these “circumstances” as being costs. If you do view them as costs, then you must ask whether the option of retaining U.S. citizenship is worth those costs of the liabilities and disabilities. – file numerous “information returns” which may include the private and financial information of others. Now, you may ask “so what?” Let me try to explain to you why this might matter in your life. But, once again, these are just some thoughts. I leave it to you to decide whether these are considerations that are significant to you. Other than the obligation, this is not likely to mean much. Your chances of being called for military service are slim. You will have to file U.S. tax returns regardless of where you life in the world. The U.S. is the only country in the world to tax its citizens regardless of where they live. This can be very financially (thousands of dollars every year) and emotionally (lots of worry and time) expensive. Although, you will get some relief from double taxation, the theory is that U.S. citizens are taxed twice – both in their country of residence and in the U.S. Furthermore, it is getting more and more difficult to find professional help that is competent in this area. It’s one thing to be subject to U.S. tax. But, it’s quite another to be “taxed” in exactly the same way that U.S. residents are taxed. Let me explain. The rules for calculating taxable income are different in the U.S. than they are in Canada. The U.S. taxes different things in different ways. There are numerous instances in which the U.S. taxes income, that has not even been earned or received. Furthermore, a number of ways of saving for retirement, that are sanctioned and encouraged in Canada, are punished under the laws of the United States. This can make normal financial planning very difficult, very expensive and in some ways, almost impossible. In this respect, U.S. citizenship (especially for those who do not live in the U.S.) is a clear disability. But, more on the “disability” issue later. There is NO financial privacy in the United States and U.S. citizens have no financial privacy whatsoever!! I might say that the U.S. is very serious about receiving all information about your assets. The fines for non-compliance can be life altering. During 2011, many U.S. citizens living outside the United States suffered mightily after learning about these requirements. These information returns (forms) are not a small job. They can take hours and hours to complete at great expense. Furthermore, they cannot be completed with the assistance of a qualified accountant or lawyer. Disabilities of U.S. citizenship: Let’s consider these from the perspective of career, financial planning, family and community. Your mother and you children have been the greatest source of happiness, purpose and security in my life. I am sure that you will want a family of your own. It probably won’t be long before you meet a fine woman, with whom you wish to embark on that great adventure of life. Even by the standards of your generation, you are likely to embark on that adventure in the form of marriage. Since you do not live in the U.S. the chances are high that your future wife will not be a U.S. citizen. Now, the U.S. requires its citizens to require various information returns with the IRS. If you have a joint bank account with her (which is common) you will be required to report much of her financial information to the IRS. I assure you that she will not be happy about this. Furthermore, should you predecease your wife, she will NOT be able to automatically receive all of the family estate in the same way that she could if she were a U.S. citizen. Is this fair to her? Now, I am not completely sure of this, but the fact that you were born in the U.S., and are a U.S. citizen, might make your children U.S. citizens. Is this an opportunity for them or is it a problem? Only you can decide. But remember, that unless they were to live in the U.S., (assuming they are U.S. citizens), they will be subject to all the legal opportunities, liabilities and disabilities, that I am describing. You are going to make some great connections at Queen’s. Your next four years will set the stage for long term business opportunities. These include partnerships and opportunities to own shares in Canadian companies. As a U.S. citizen you will be required to disclose information about these partnerships and corporations to the IRS. . For this reason, (quite understandably) many non-U.S. citizens are unwilling to enter business relationships with U.S. citizens. Companies outside the U.S. are becoming increasingly reluctant to employ U.S. citizens. The reasons include the high costs associated with U.S. taxation and the danger that the U.S. employee, will be required by U.S. law to disclose financial data of a non-U.S. company to the IRS. Once again, this will include the obligation to report the private financial information of non-U.S. citizens to the IRS. Yes, this is becoming problem. U.S. laws impose high financial and legal costs on non-U.S. banks who have U.S. citizen customers. For example, there are countries in Europe that will no longer allow U.S. citizens to have bank accounts or receive mortgage financing. It is unclear what the Canadian situation will be. Enough on the possible problems. I remind you that U.S. citizenship does carry some opportunities. You must consider whether U.S. provides you with opportunities that outweigh those problems. Let’s explore what each option means. You are subject to all of the requirements I outlined. You will be disabled from saving and investing for retirement in the same way that other Canadians can. – your (I assume) non-U.S. wife will be at a great financial disadvantage should she become a widow (is this fair to her)? U.S. citizens who have a net worth of two million dollars or more must pay the U.S. government an “Exit Tax”, should they renounce. This can be very very expensive. For those subject to the “Exit Tax” the financial penalty can so great that they feel trapped and unhappily remain a U.S citizen. At this stage in your life, you might think that a net worth of two million dollars is a lot of money. The truth is that is is not. Furthermore, (given the realities of inflation), you will are likely to achieve that level of net worth quite quickly. Our Toronto home, where you sleep every night, is probably worth two million dollars. Therefore, if you decide to renounce your U.S. citizenship, you should do it now rather than later! This decision does not have to be made today or tomorrow, but should be made by the time you graduate from Queen’s! I began this letter inviting you to think about “Good citizenship” and “Your citizenship”. “Good citizenship” includes a consideration of how your behavior affects your family, friends and community. Is it possible that “Your citizenship” might affect your obligations of “Good citizenship” (particularly in relation to family)? You are headed towards a great future with loads of opportunity. Your U.S. citizenship is an “accident of birth”. I encourage you to deal with this issue NO LATER than than the end of your four years at Queen’s. I am proud of you, love you and wish the best for you! That’s a very well-written and convincing letter. Checking my email. Glad I did to read this excellent post, renounce! How I wish I had known to give this advice to my daughter, born in Canada, when she graduated from high school. Great letter, very articulate and well written. Thank you for sharing it with us. It also helps us to find the words to describe to others what the current problems are. Excellent Letter!! Thanks for sharing this.. I will have my son read it. Thank you! Reblogged this on The Desi Ways. Well-written letter! I like how you describe the distinction between good citizenship and your citizenship, and how one can hinder the other. Exact situation I was in – Born in the US to parents who were completing post-doctoral work. Very well thought out analysis and presentation of the issues. Wonderful letter – I plan to write a similar one to my son and daughter. It is very sad this US administration has chosen to make US citizenship a curse rather than an honor overseas as it once was. Thanks for your comment. Yes, it is absolutely incredible. It is particularly painful given that so many U.S. citizens abroad have been proud ambassadors for the U.S. in a world that contains much more resentment of the U.S. than those in the U.S. realize. For this reason alone, I suspect that history will show the U.S. treatment of its expats to have been a serious mistake. US citizenship-based taxation is a “Fiscal Prison” that has little to do with taxation. It has everything to do with controlling mobility and life opportunities through “reporting requirements” and threats that isolate US citizens abroad and cut them off from many opportunities for “life, liberty and the pursuit of happiness”. It does it today by forcing people to retain US citizenship unless they want to jump through numerous tax hoops – Exit Tax, etc. Either way, the US does violence to the right to choose one’s citizenship. Rather than recognize that citizenship is a voluntary association, the US takes the position that it has an ownership interest in its citizens. The US government defines people as citizens based on a characteristic they have no control over (birth) and uses its defintion of US citizenship as a weapon. The U.S. government believes that it has a “property interest” in its citizens. To have a “property interest” in a human being is to to treat that person as a slave. It is ironic that the 14th amendment was originally intended to obliterate incidents of slavery. Now the 14th amendment (“Everybody born in the US is a US citizen” is used to create slavery. Second: The US government has a long history of using taxes and the IRS for improper purposes. As I write this comment Obama’s IRS has admitted to improperly targeting conservative groups. When it comes to US citizens abroad, the US government is using a perfectly coordinated attack using the twin weapons of citizenship and taxation to make the lives of U.S. citizens abroad a living hell. The final chapter on this is unfolding as the US attempts to roll out FATCA. @USCitizenAbroad WOW! That hit HOME! You have no idea how close!